Motto: "Together We Build the Future"
Phi Sigma Rho is a national social sorority for women in engineering, engineering technology, and other similar technical studies. The organization based upon the ideals of Friendship, Encouragement and Scholarship. Through these ideals, the chapter is actively involved on campus at Purdue University. Members participate in social activities within the Greek system, philanthropic events, scholastic projects, and bonding activities for members. In addition to other community service events, the sisters of Phi Sigma Rho put on Phi Rho Your Boat, an annual event to benefit the Leukemia and Lymphoma Society. Since the founding, Phi Sigma Rho has become dear to many hearts and helped women to become well-rounded in preparation for their professional pursuits. Membership has also grown to reach women in other technical curriculums beyond engineering. Ever expanding, there are currently many chapters of Phi Sigma Rho throughout the United States and alumnae located around the world. The sisterhood is a bond between these women that will keep them connected forever. Phi Sigma Rho was founded here at Purdue University in 1984 by two exceptional young women, Abby McDonald and Rashmi Khanna Drummond. They realized how easy it was for engineering men to rush a fraternity but how challenging it was to rush a sorority carrying a tough engineering curriculum. They also noticed that there were fraternities specifically for engineering majors but no sororities for engineers. From their first discussion, the idea for creating a social sorority that could accommodate a rigorous engineering schedule was born. 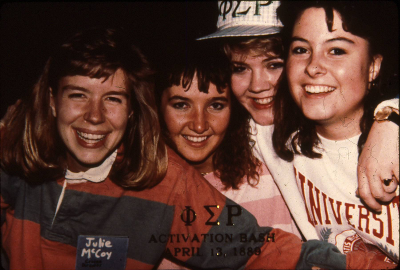 A short time later on September 24, 1984, the first chapter of Phi Sigma Rho was created with 10 charter members. Currently the Alpha Chapter has 140 active members and a house in Tower Acres in which most members live.